To meet the new regulations, federal contractors are looking for qualified people with disabilities to fill jobs. This is great news for individuals with disabilities – it is estimated that this could create as many as 600,000 new employment opportunities for individuals with disabilities. Federal contractors will also be inviting job applicants, as well as their current employees, to voluntarily disclose, or what we call self-identify, that they are individuals with a disability. 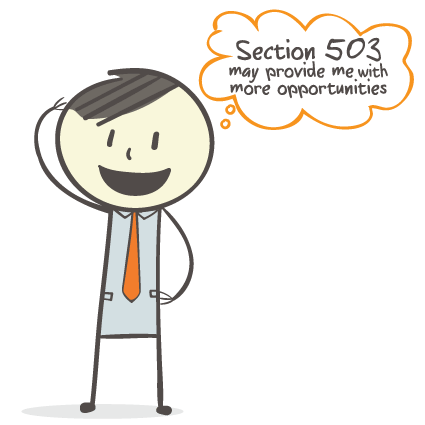 Because of the changes to Section 503, federal contractors are looking for qualified people with disabilities to fill jobs and help businesses meet the new requirements. This is great news for individuals with disabilities – it is estimated that this will create roughly 600,000 new employment opportunities for individuals with disabilities. Federal contractors will also invite job applicants, as well as current employees, to voluntarily disclose, or self-identify, that they are individuals with a disability. Click the right arrow to continue.